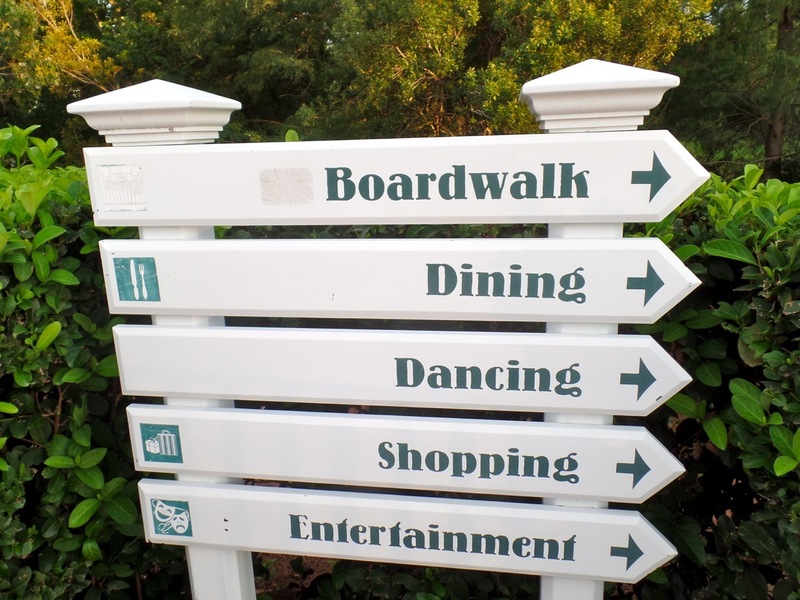 Monday morning the Duval County Public Schools will open their doors for the first day of the 2014-15 academic year. 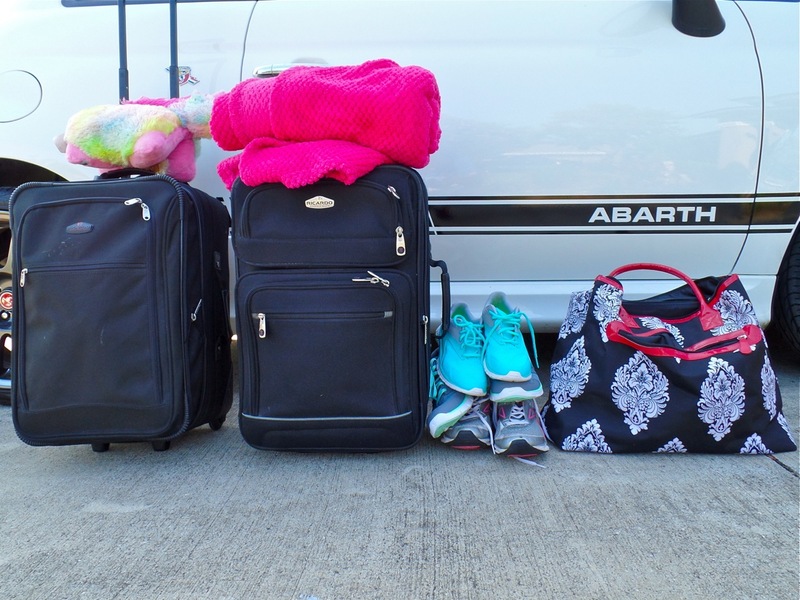 For me, the first day of school means two things: the majority of my last two pay checks went towards new clothes and school supplies and my family just returned from our annual end-of-the-summer celebratory road trip. 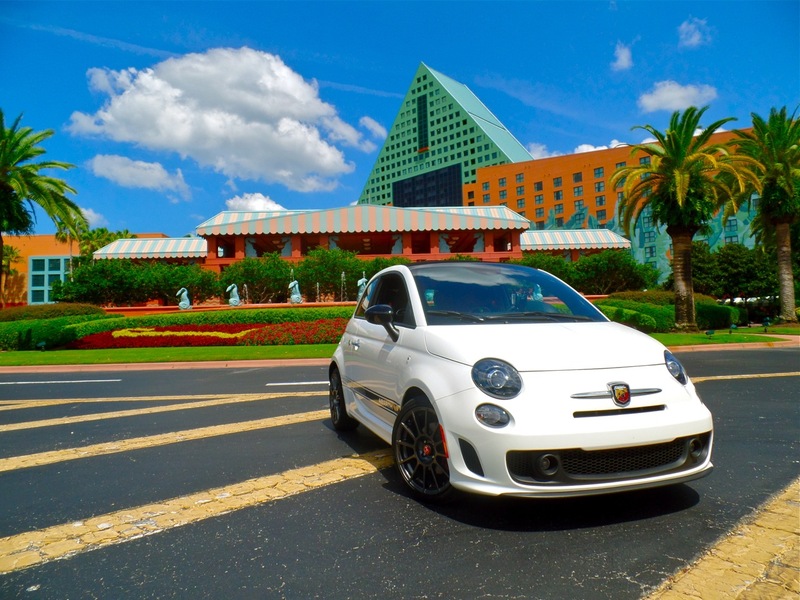 This summer’s trip was a quick get-away to the Walt Disney World Swan and Dolphin resort for a few days of late night ice cream sundaes, sleeping-in, and water slides. 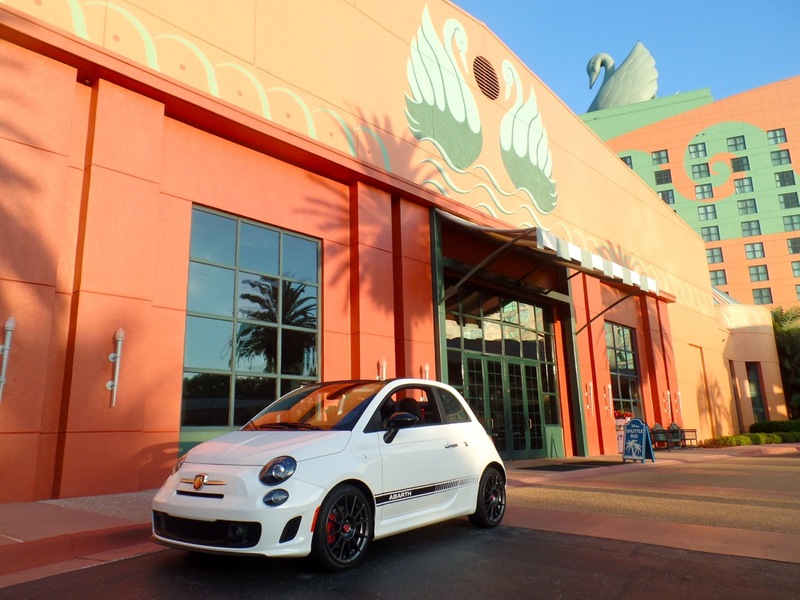 The 170-mile ride to Kissimmee normally takes about two and a half hours, but our tradition is to stop along the way at family favorite locations, which means it takes us at least five. 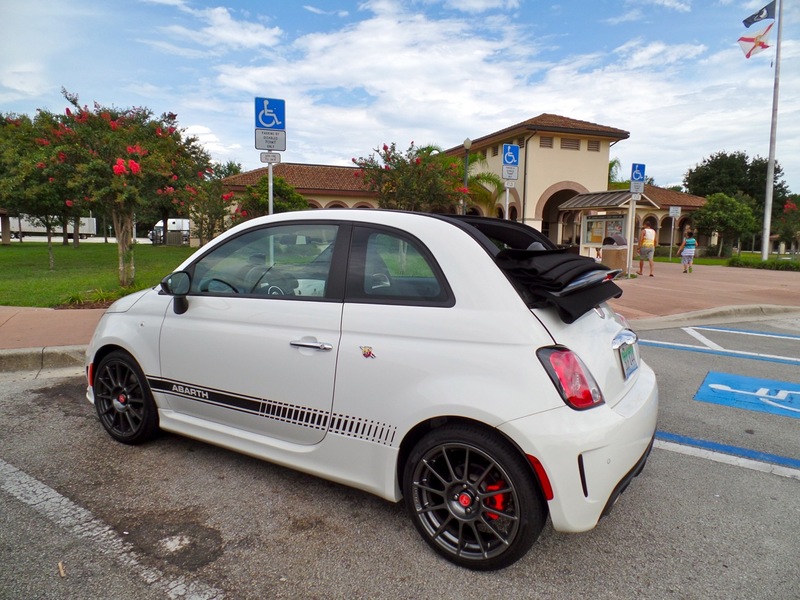 The mode of transportation is of central importance and having an automotive journalist for a dad usually means that he has contacted a manufacturer to set up a large SUV or mini-van for the trip, except when he has been busy traveling and forgets. 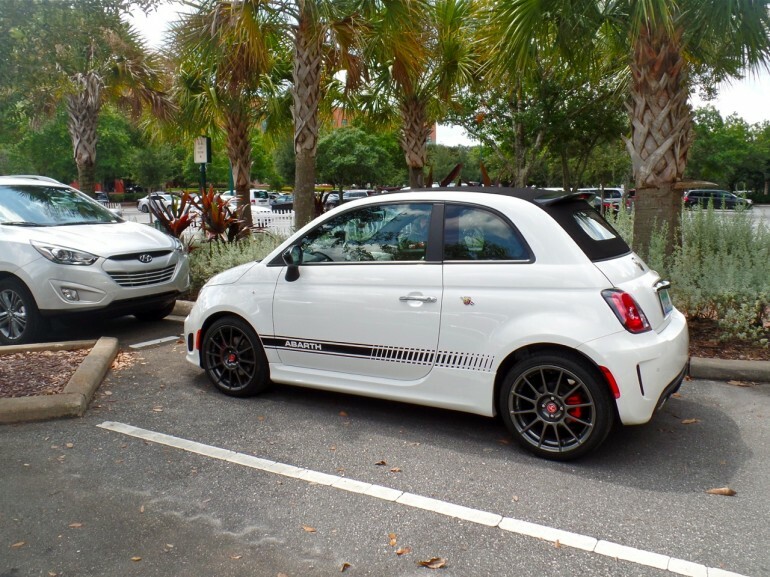 In which case an adorable 2014 Fiat 500c Abarth Cabrio shows up in the driveway. 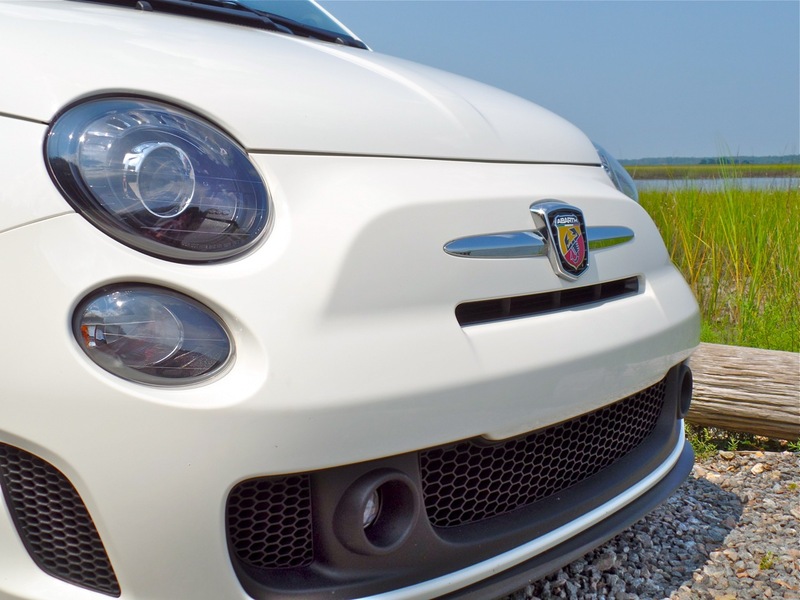 The Fiat 500 is an Italian subcompact, known by children of all ages for playing Luigi, the tiny little yellow car that owns Luigi’s Casa Della Tires in Walt Disney’s Oscar nominated and Golden Globe award winning animated feature Cars. 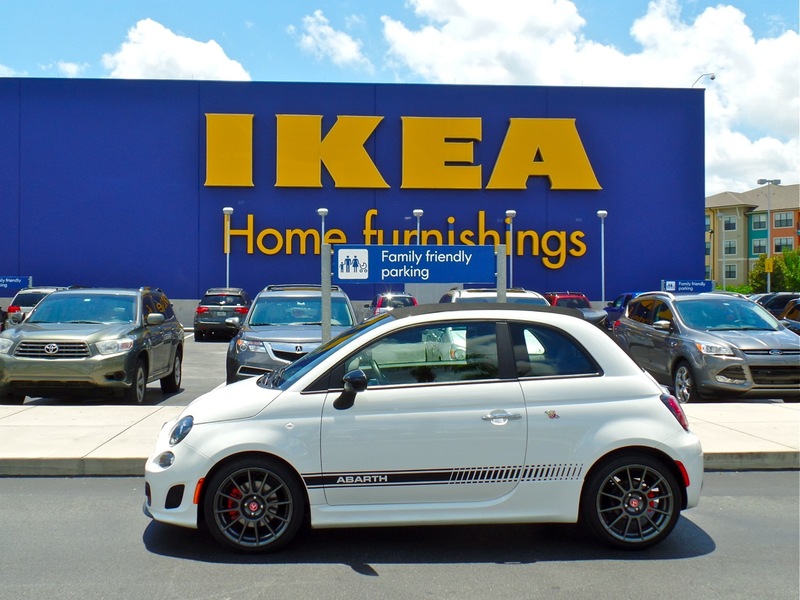 First introduced in 1957, the original 500 was only 9 feet 8.9 inches long, 4 feet 4 inches wide and 4 feet 4 inches tall. 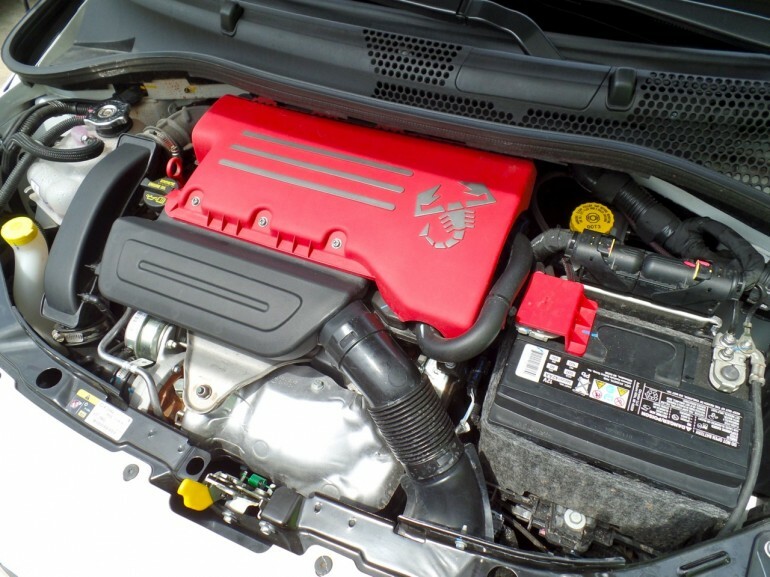 The 1,100 lb rear engine, rear-wheel-drive car had a 479 cc (500cc nominal, hence the name) engine good for 13 horsepower when tuned to perfection. 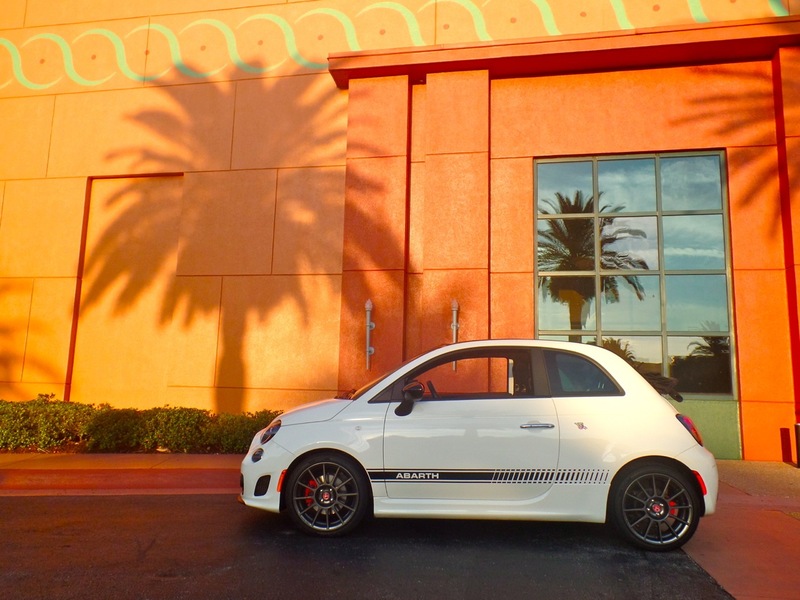 The 500 redefined the term “compact” and helped create a new automotive classification, the city car. 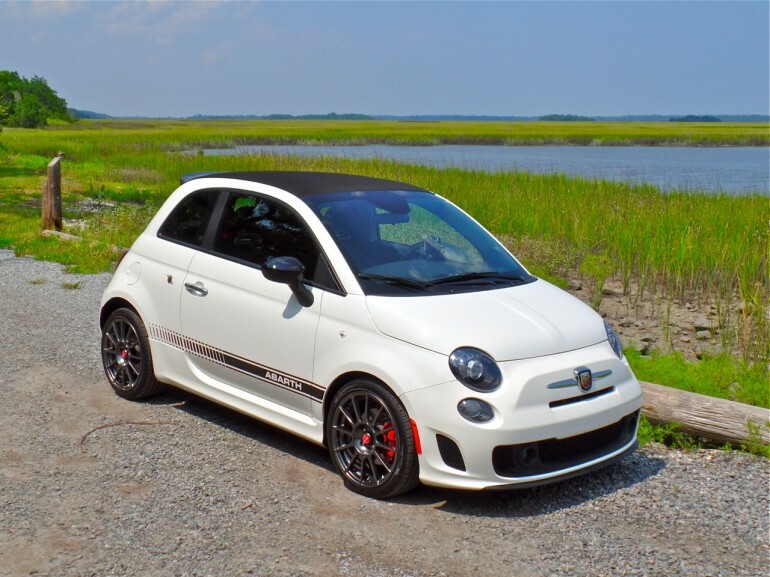 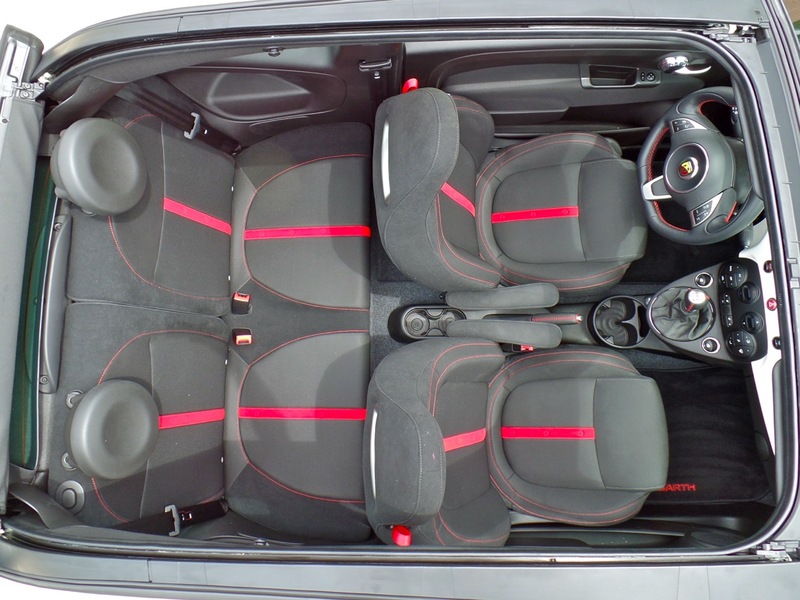 The latest Fiat 500 began production in 2007, making its way to the US for the 2012 model year. 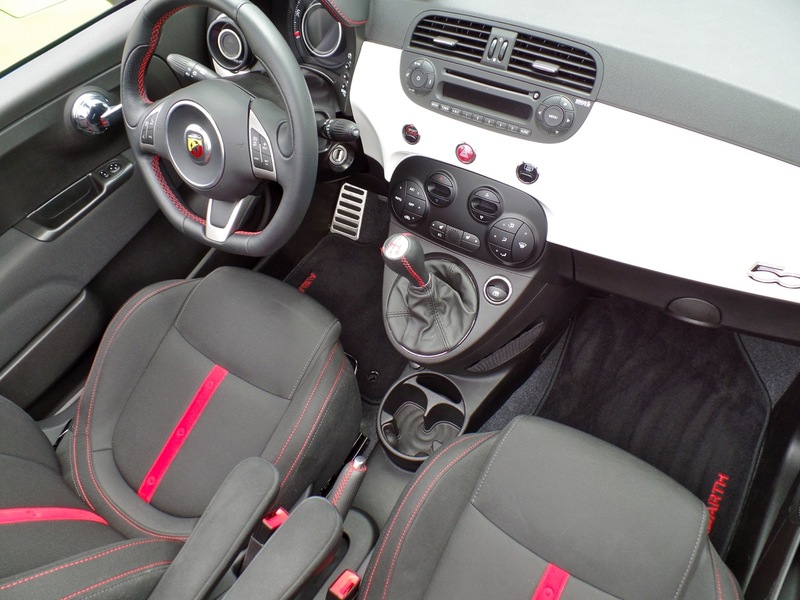 Retaining the classification of “city car”, the mini-compact is considerably larger – 27.5 inches longer, 12.1 inches wider, and 7.2 inches higher – and more potent than the original. 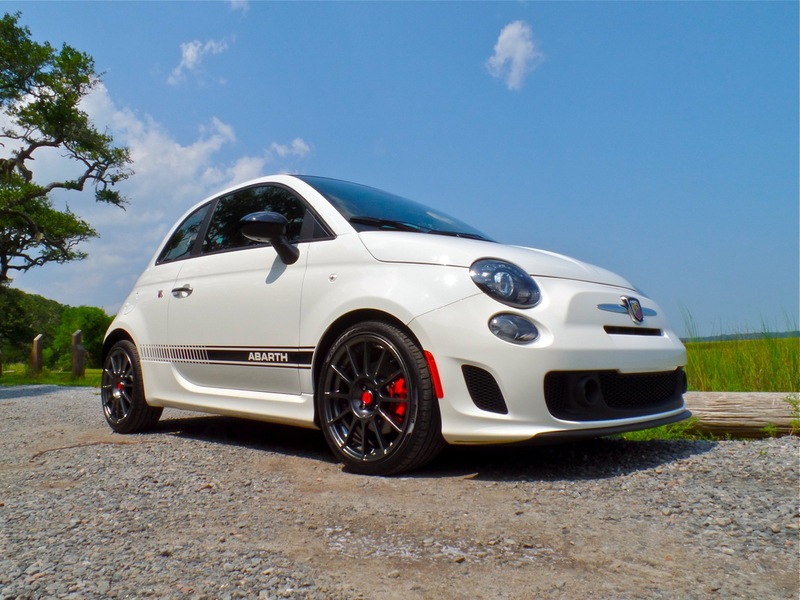 Powered by three versions of the 1.4L 16 valve inline-4, the base 500 is capable of producing 101 horsepower and 98 lb-ft of torque, the 500 turbo kicks things up a notch with 135 hp and 160 lb-ft of torque, and my top performance turbocharged Abarth model makes a healthy 160 hp and 170 lb-ft of wheel-spinning torque. 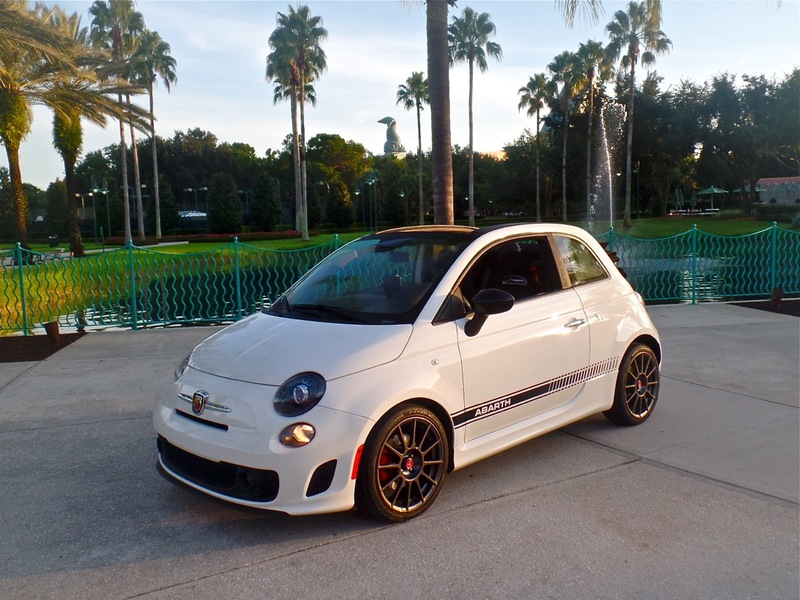 Fiat also offers an award winning 111 horsepower and 147 lb-ft of torque 500e all-electric model. All 2015 gas models are equipped with an amazingly easy to shift 5-speed manual or a 6-speed automatic. 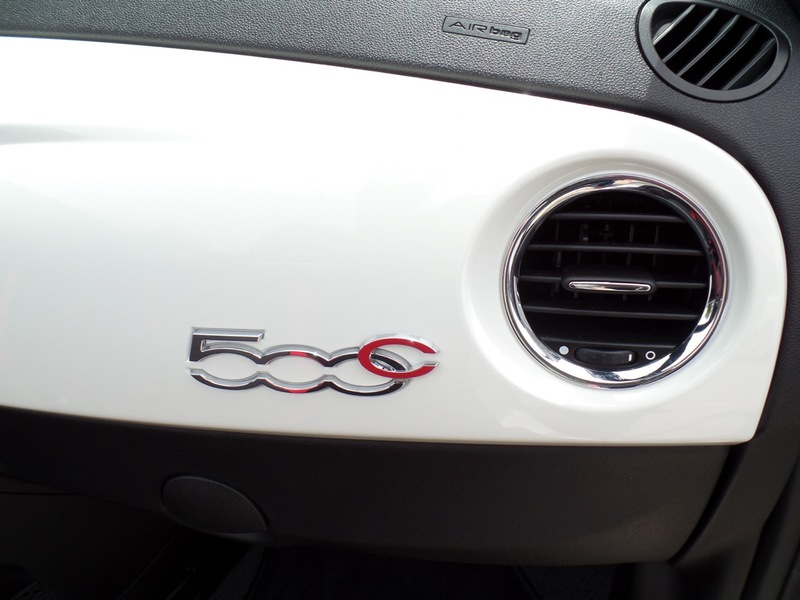 The 500e employs a single-speed gearbox transmission with calibrated gear reduction. 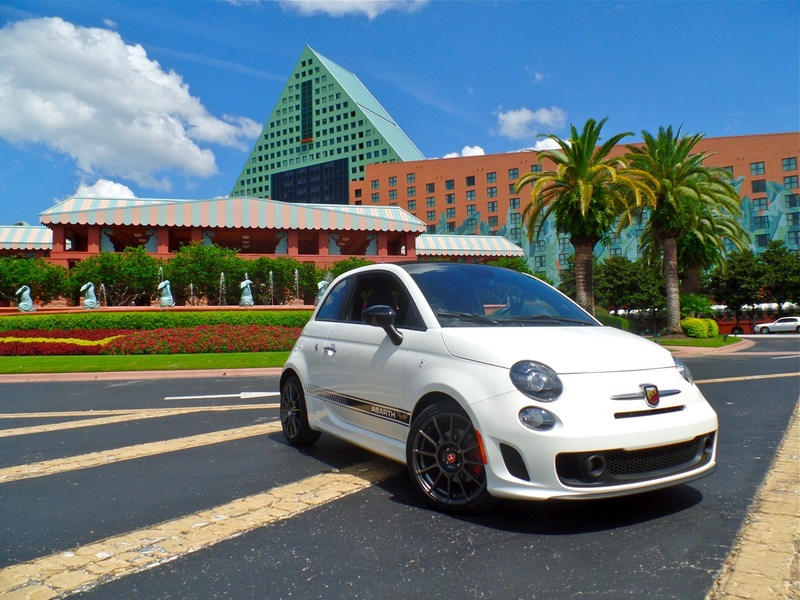 After a family meeting and thirty minute test-drive we decided to take Luigi, I mean drive the 2014 Fiat 500c Abarth Cabrio, to Walt Disney World. The girls fell in love with the Fiat’s styling, unique roll back convertible top, and the powerful sound system. 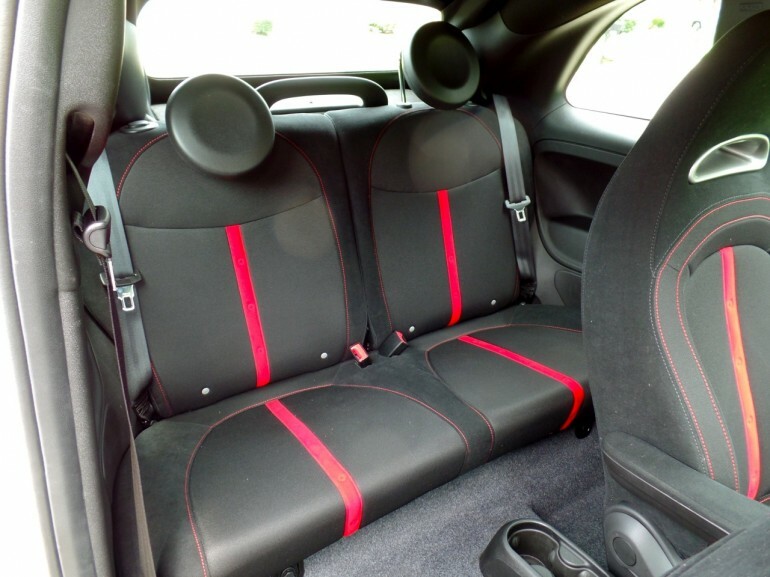 Make no mistake, the interior is small, but for two adults, a teenager, and a rising middle schooler, it is surprisingly roomy. 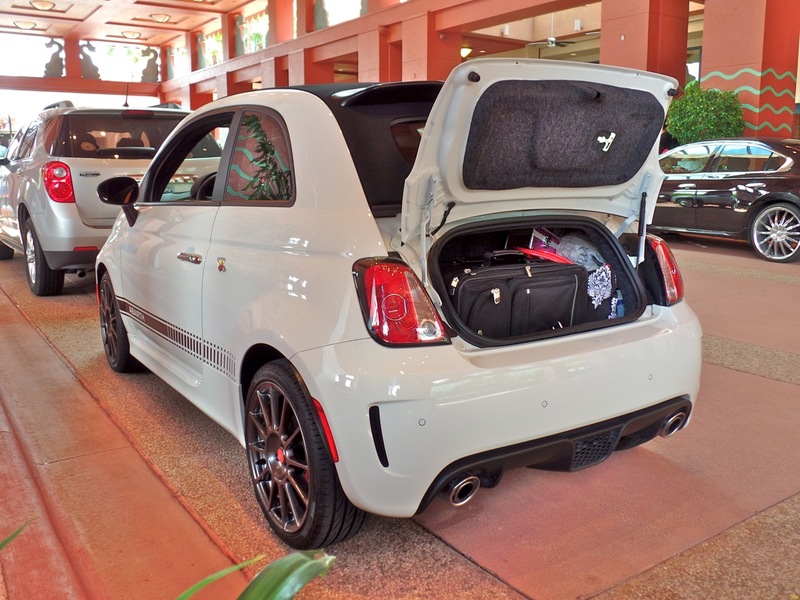 The obvious limitation was the miniscule 5.4 cubic feet of trunk space, if we were going to take the Abarth we needed to pack light. 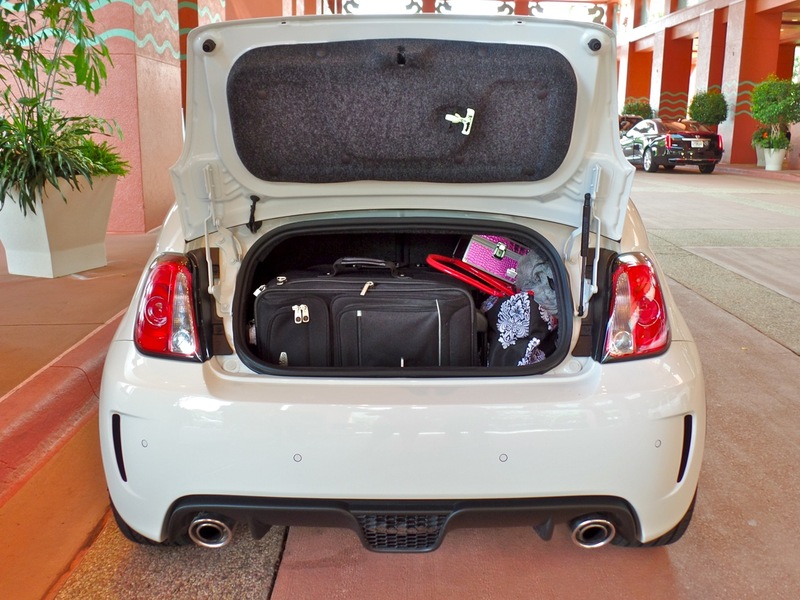 After some experimentation I discovered that two airline-limit-size carry-ons, a small cargo duffel bag, one Dopp kit, a couple of blankets, a handful of mandatory reading list books, and three pairs of sneakers would still allow the trunk lid to close and provide a little room for souvenirs. 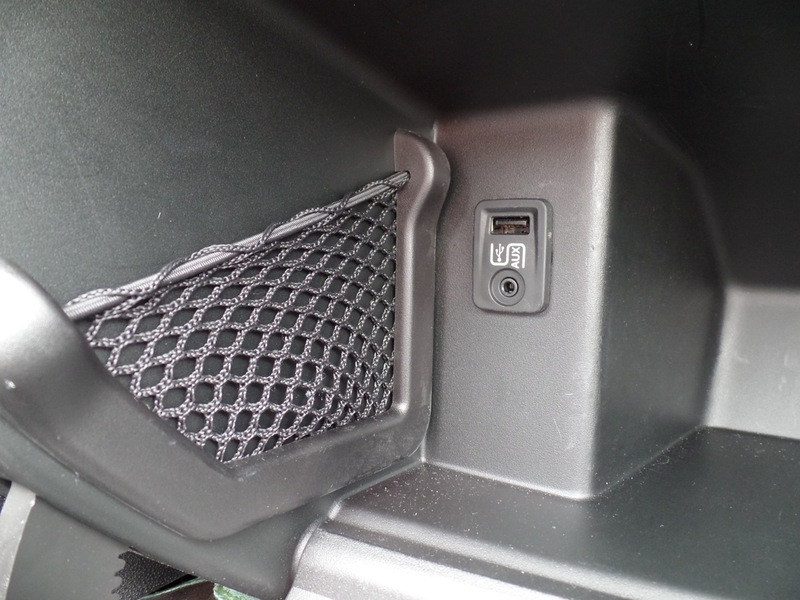 My family was also able to utilize a little bit of legroom for small backpacks and electronics. 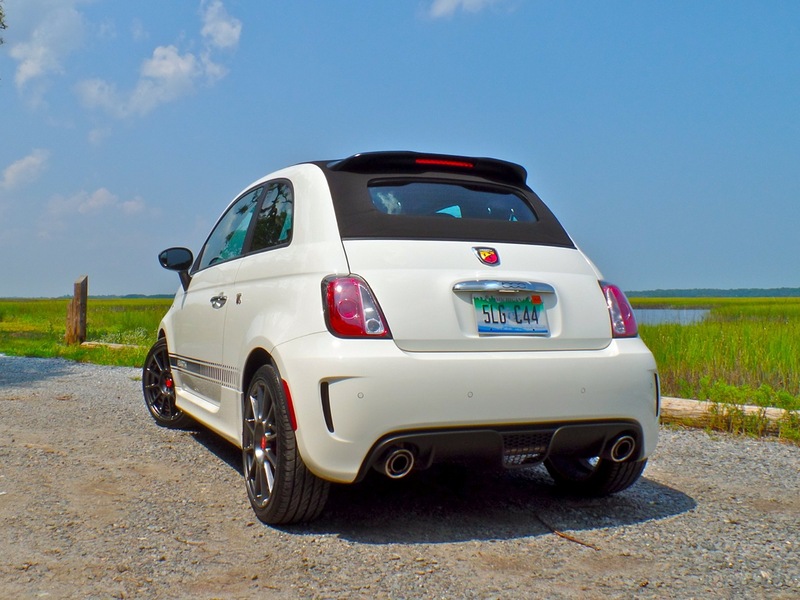 Driving the 2014 Fiat 500c Abarth around the city is an absolute blast. 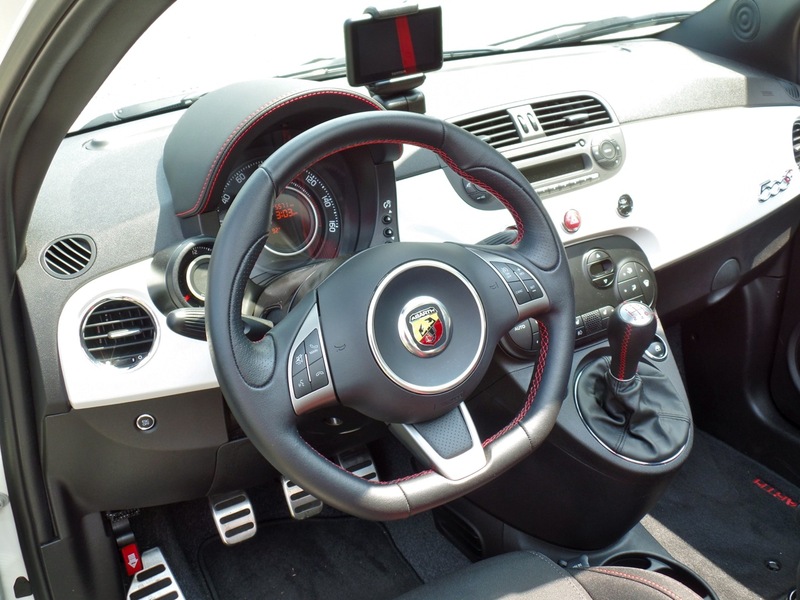 Handling is tight, braking is aggressive, the 5-speed is just where you want it, the clutch is compliant, and under full throttle the turbo boosts, according to the extremely cool steering column mounted gauge, at a vigorous 18 psi. 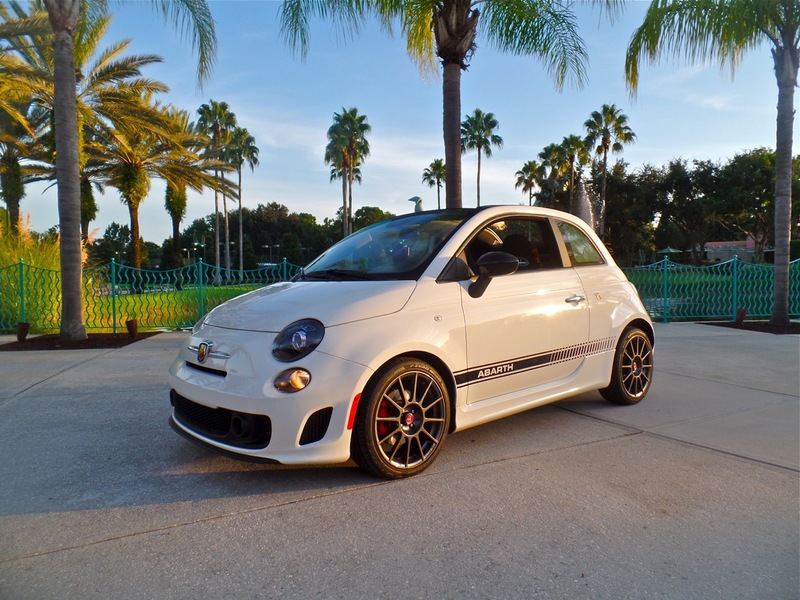 The horsepower and torque numbers may seem conservative by today’s sport and muscle car standards, but the Fiat’s bantam curb weight of only 2545 lbs means that more of the power is available to make the car go fast, rather than just go. 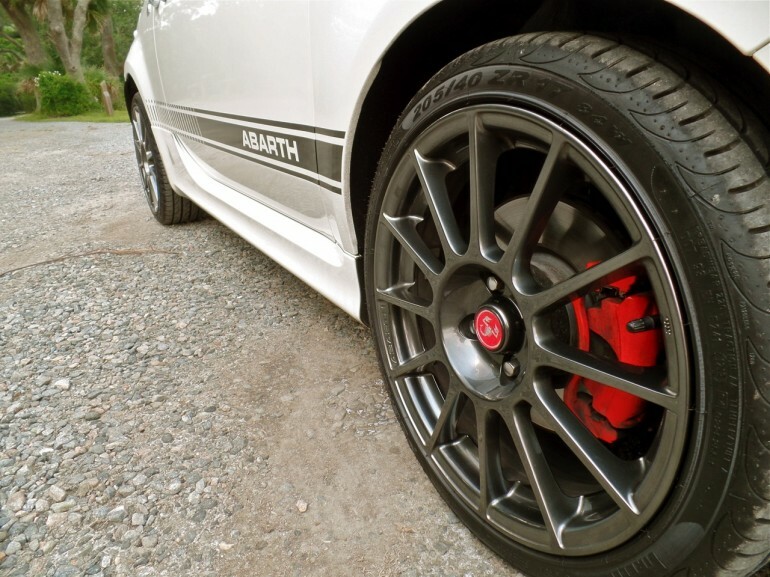 The full boost induced torque steer adds to the driving excitement, as does the Abarth’s exhilarating exhaust. 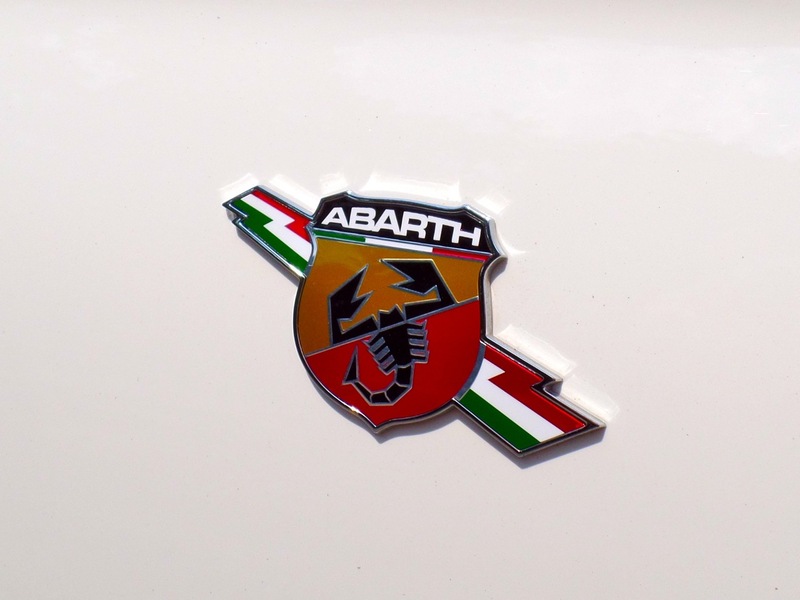 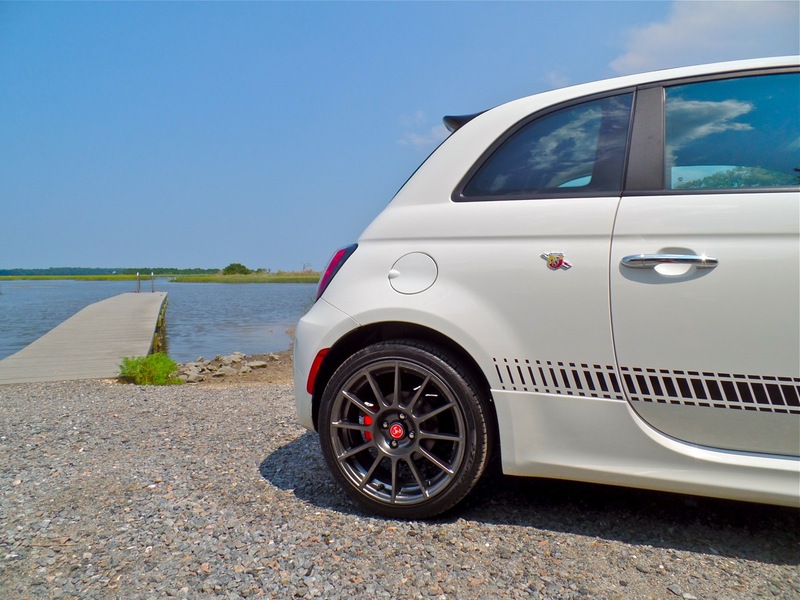 Originally known as a boutique high-performance exhaust manufacturer, the 500 keeps the Abarth tradition alive and well. 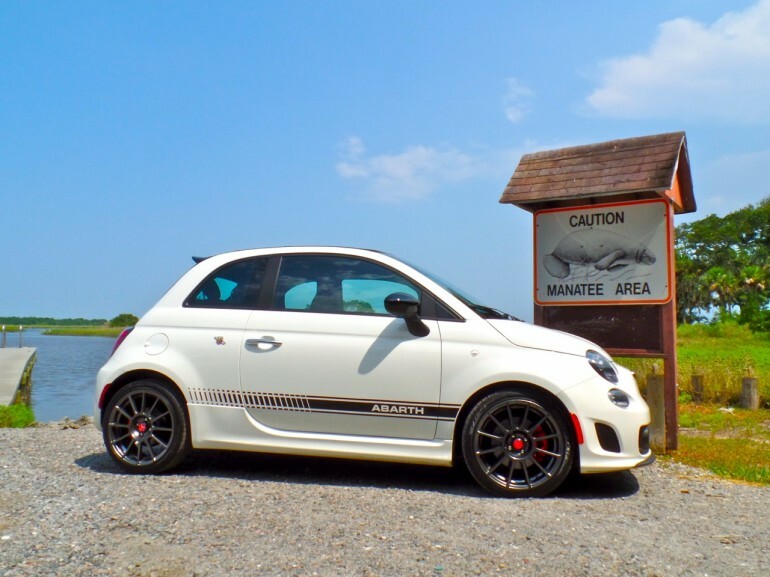 From the ill-tempered snarl at idle and irascible growl at full throttle to the giggle inducing snaps and pops elicited while ratcheting through the gears, the Abarth’s exhaust belies the car’s tiny frame. 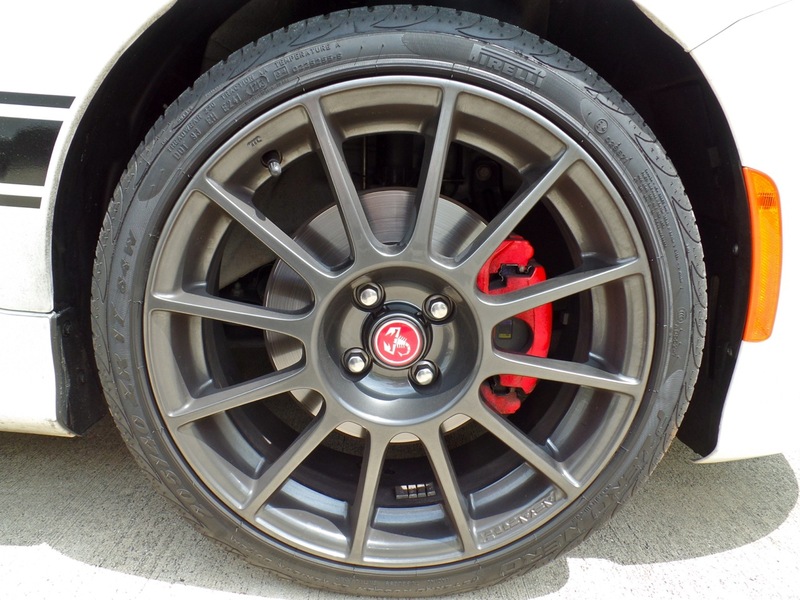 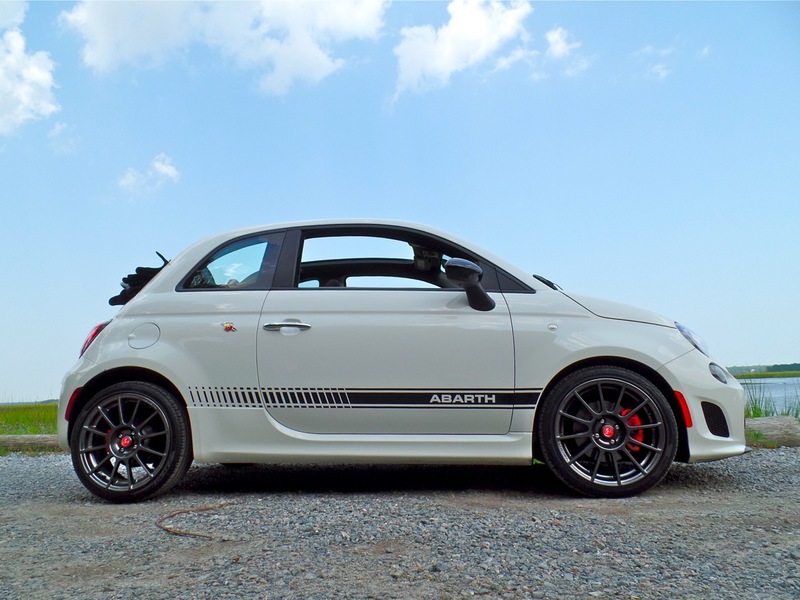 Highway driving is less exciting, but better than I expected for a vehicle proudly dubbed a “city car.” The 17-inch forged aluminum wheels wrapped in BSW three season tires combined with the Abarth high performance suspension provide a smoother than expected ride quality. The sport seats are firm and designed to be supportive, but certainly not luxurious. 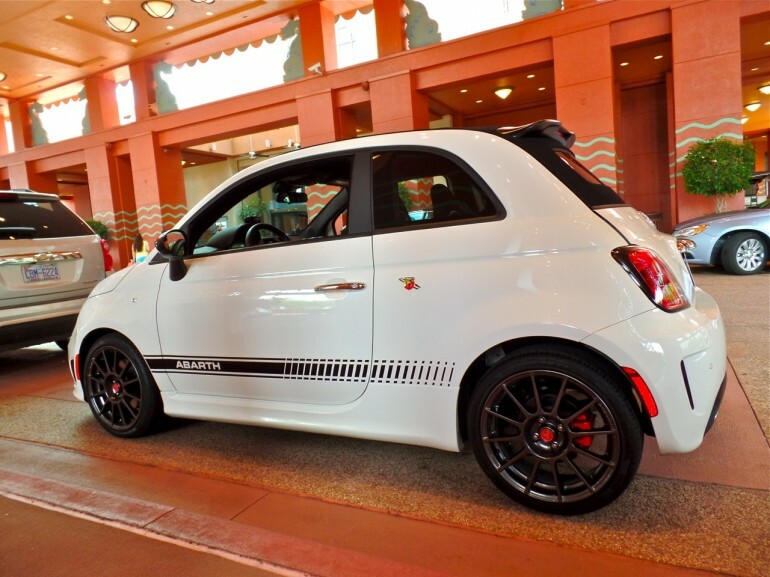 Would I want to take the four of us on a cross-country road trip to Seattle? No. 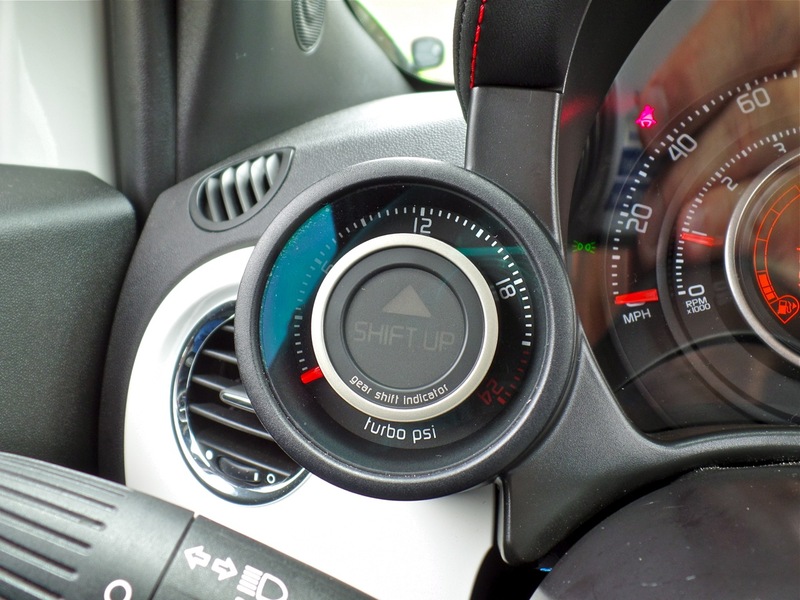 However, the nifty factory installed dashboard mounted TomTom Navigation led three-hour-plus ride was rather enjoyable. 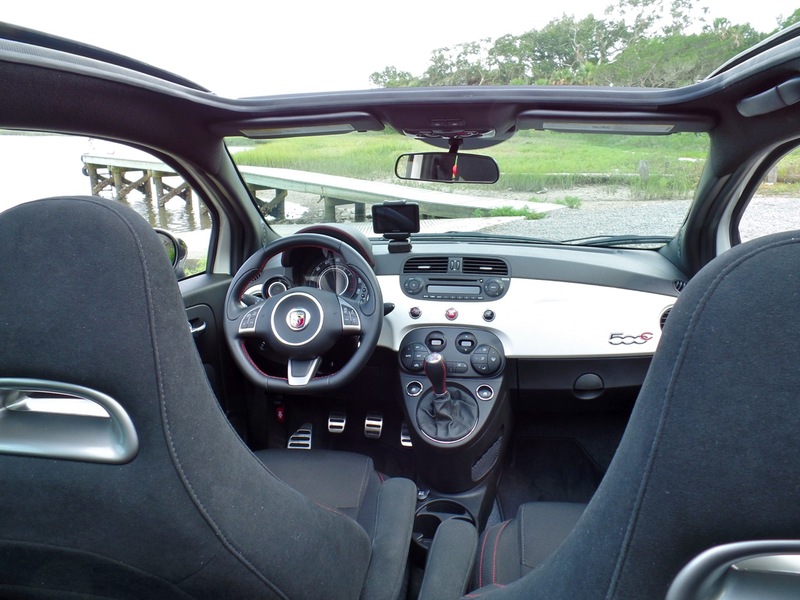 Out on the highway it is amazing how quickly you forget that you are riding in such a tiny car. 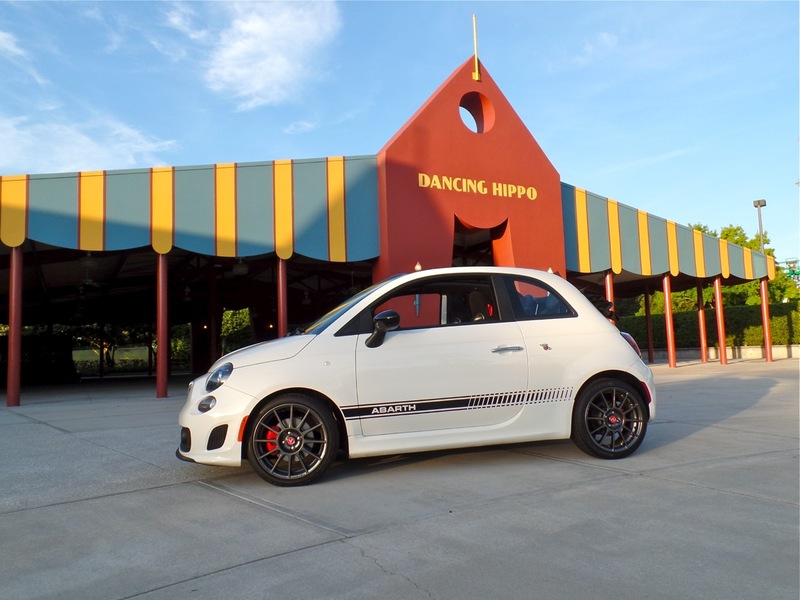 If it weren’t for the parade of grinning passengers in passing vehicles giving us the thumbs up, the 34 mpg highway trip would have seemed pretty mundane. 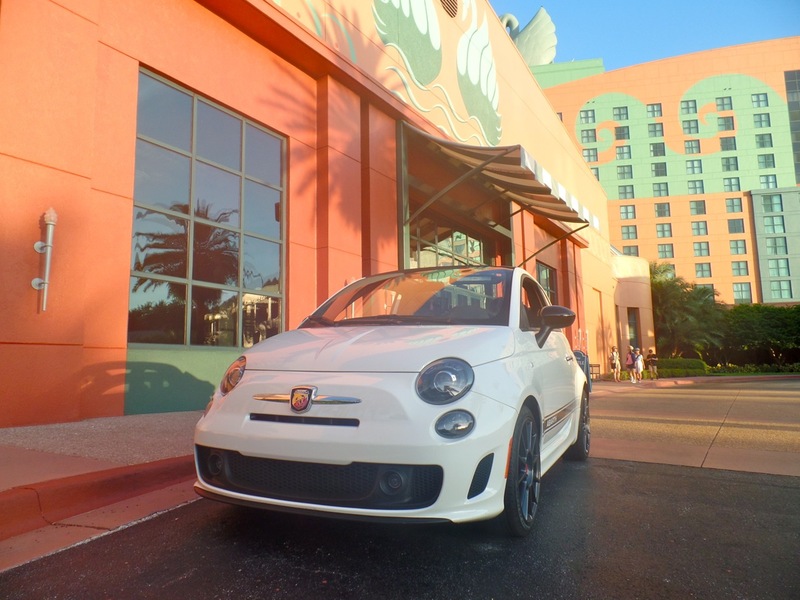 Pulling up to the valet area at the Dolphin, three eager bellhops greeted us, quickly surrounding the driver’s door like bumble bees at the entrance of a hive. 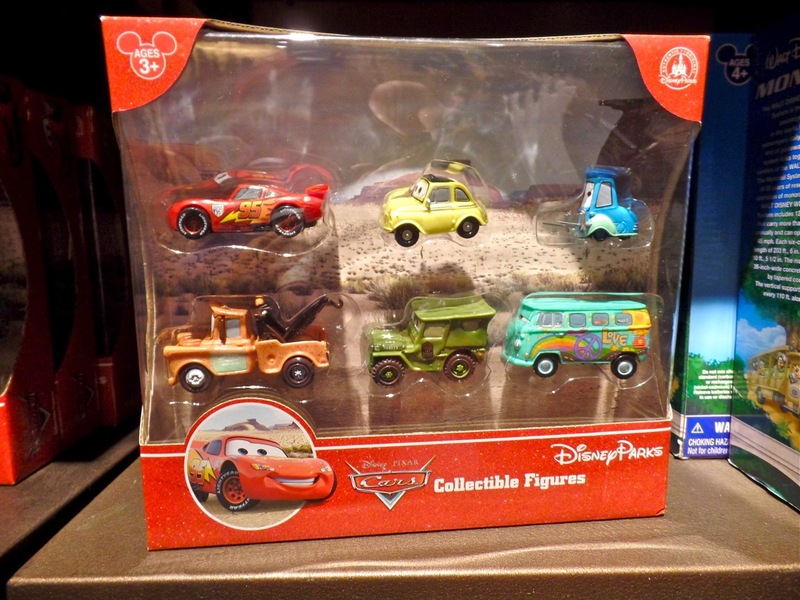 The collective groan when I announced I would self-park reminded me of the sound that my brother and I would make when mom would ask us to clean our rooms. 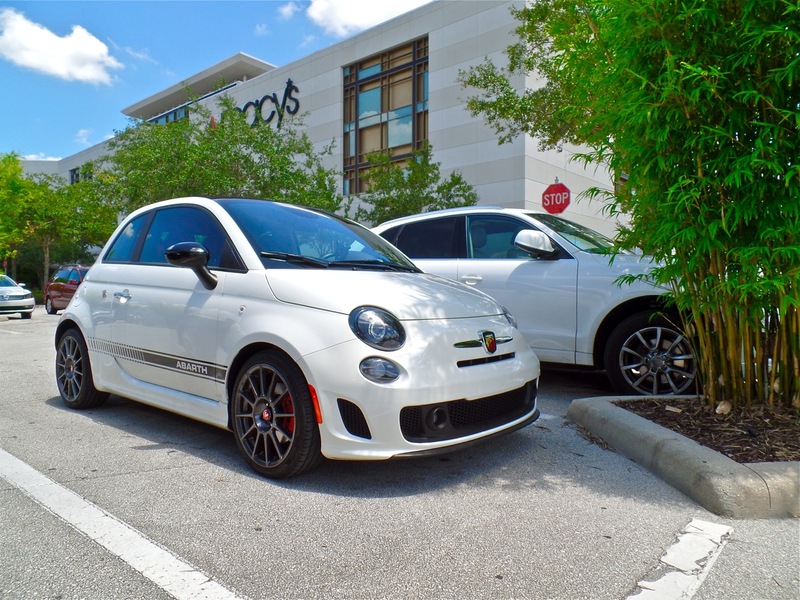 The only thing more fun than driving the Fiat 500c Abarth is parking it. 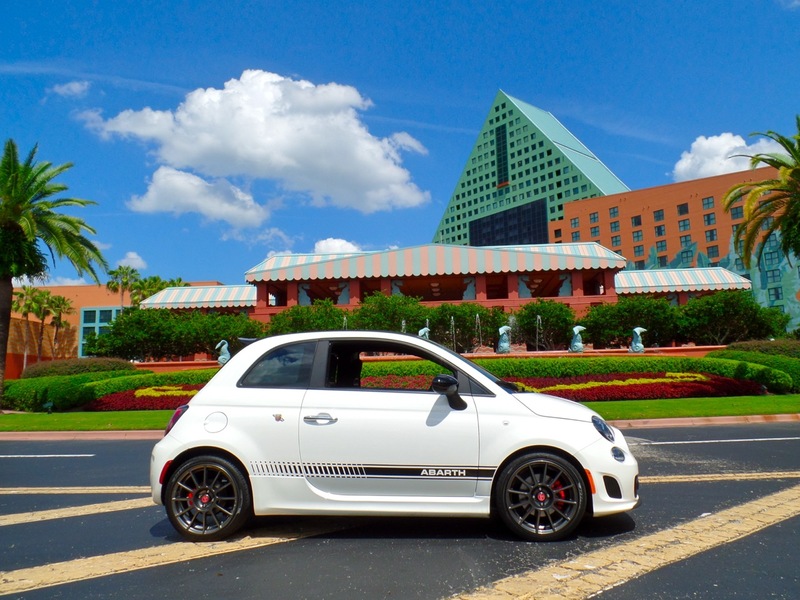 That tiny, obstructed space that is prevalent at all of the theme park hotels is actually perfect for the Abarth. Parallel parking is a cinch and the concern that I usually have over potential parking lot dings is almost a moot point, the Fiat is so narrow that the distance between cars is enough that even the most enthusiastically opened door won’t make contact with the Fiat’s shapely body work. Typical for an end of the summer outing, our stay at the resort ended far too soon and although we ate excessively and picked up some keepsakes along the way, we still fit comfortably in the mini-compact 500 and completed the return trip incident free. 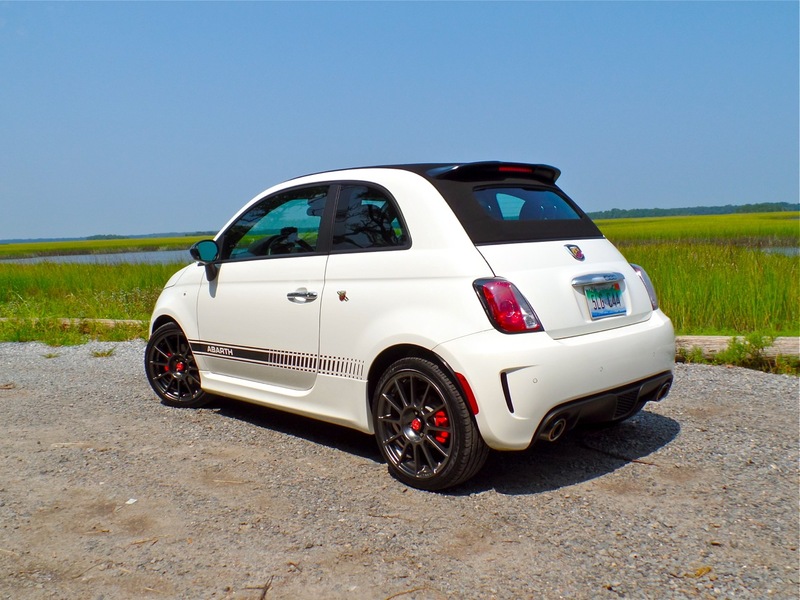 While there are hundreds of cars, trucks and SUVs on the market that would have made the trip with ease, very few of them would have done it with so much style and created so many fun memories. 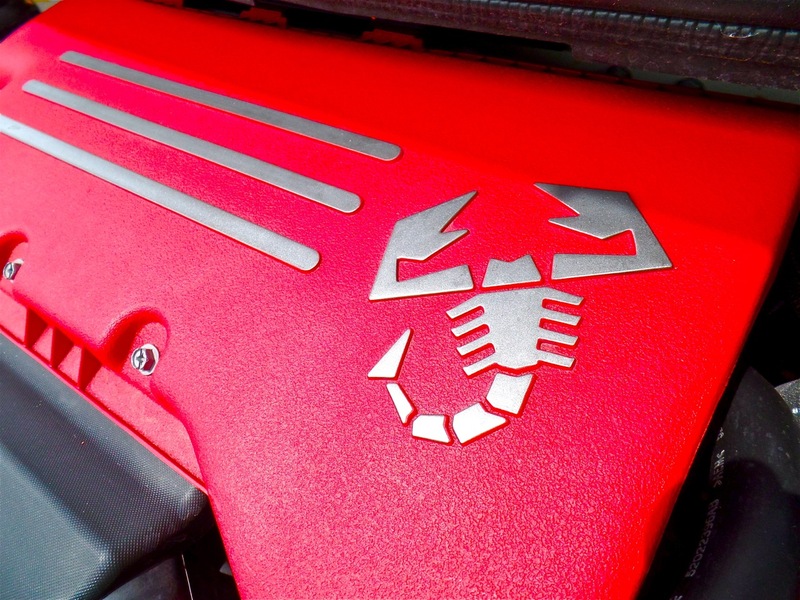 Sometimes the apparent “mistake” is what really makes life interesting.